Smoothies are a staple in our house, and I’m always looking for ways to keep things interesting, fresh, and packed with dense nutrition. Lately we have been using whatever seasonal vegetables show up in our produce pick up, and when we had some amazing fresh strawberries that we weren’t going to eat quickly with the abundance of other yummy fruits, I quickly washed them, hulled the leaves off the top and froze them for another day. 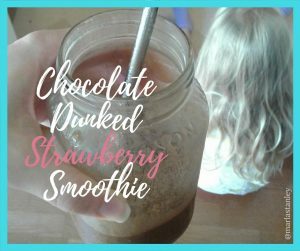 This Chocolate Dunked Strawberry Smoothie was utter perfection. Add water, shakeology, strawberries, ice, and blend until smooth. If you are interested in trying Shakeology, message me for additional information, or you can shop here.